This silicone soap mold allows for soapers to create a modern version of the classic rectangle soap. The soap made with this mold is slightly narrower and slightly thicker than a traditional bar. Melt & Pour Soap (MP). Cold Process Soap (CP). Cold Process Oven Process Soap (CPOP). Hot Process Soap (HP). Lotion Bars. Melt & Pour Soap: Pour melted soap into silicone mold cavities. Allow soap to cool at room temperature until hard. Carefully remove soap from mold by gently pulling the sides away from the soap, and then push on the bottom of the mold until the soap starts to release. Grab hold of the soap and carefully pull out of the mold. Cold Process Soap: Pour soap at trace into the mold cavities. After at least 24 hours, gently pull silicone mold to loosen its grip on the soap. Flip mold over onto a clean surface and gently push on the bottom of mold until the soap starts to release. Grab hold of the soap with a gloved hand, and allow soap to cure for 4-8 weeks. Note that some cp soap recipes may require a week to harden enough to remove from the mold. If this is the case with your recipe, we recommend adding sodium lactate to your recipe to assist with creating a harder bar faster. Cold Process/Oven Process Soap: Pour soap at trace into the mold cavities. Preheat oven to 170ºF then place mold in oven. Turn oven off, and keep soap in oven overnight. The next day remove mold from oven. Carefully remove soap from mold by gently pulling the sides away from the soap, and then push on the bottom of the mold until the soap starts to release. Grab hold of the soap and carefully pull out of the mold. Allow soap to cure for 2 to 4 weeks. Hot Process Soap: Scoop hot process soap into mold cavities. Gently tap the mold onto the counter to remove air pockets. Allow soap to cool and harden. (This can take up to 48 hours.) Carefully remove soap from mold by gently pulling the sides away from the soap, and then push on the bottom of the mold until the soap starts to release. Grab hold of the soap and carefully pull out of the mold. 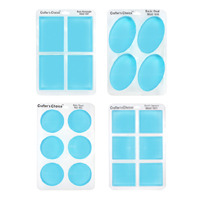 Lotion Bars: Pour melted lotion bar mixture into mold cavities. Allow mixture to solidify. Carefully remove lotion bars from mold by gently pulling the sides away from the lotion bars, and then push on the bottom of the mold until the lotion bars starts to release. Grab hold of lotion bar and carefully pull out of mold. Hand wash in warm sudsy water. "15 Cavity Euro Rectangle Silicone Soap Mold 1613"
COMMENTS: I have a medical issue that causes my hands to shake. That’s turned out to be a problem with making loaves of soap - with all the unmolding and cutting, even with a cutter. I still wanted a somewhat hefty bar that could comfortably fit in my hands. And this sealed the deal. I’m back to order the 5 pack and I’m so excited! Very very highly recommended! I immediately a cp batch of 95% shea butter and 5% avocado oil and a few additives and unmolded in less than 12 hours. This is officially my go-to mold. Happy. Happy. Happy. "Perfect size and shape bars"
COMMENTS: The cavity size and shape for this mold is perfect for my use. You can make a batch to fill all or only some of the mold. I am new to making CP soap and like to use this mold for a test batch where I can see what a recipe will do without making a ton of bars. As with any silicone based product, if you use fragrance this mold will retain the fragrance. IT WILL NOT effect the next batch of soap. Be sure and fill the cavities with the mold on a level, flat, transportable surface, Once full with soap batter I do not recommend moving the mold without a board or pan underneath until the soap sets (of course). COMMENTS: I love that I can make more than one type of soap! I also love the shape! COMMENTS: These crafters choice moulds are superb. They are one of the few moulds purpose built to make soap rather than cakes etc, and so they are actually large enough to produce a decent bar of bath soap. I live in England, and the postage was seamless: it took a week (!) and since the duty was pre-paid, I had no problems with the post office. The lady who contacted me about the order was charming. I can't recommend this firm enough. • Shape. Size. Ease of use. COMMENTS: Each cavity is of decent size- each of my bars weighed over 5 oz before curing. They make a nice, solid block of soap which my friends and family seem to find more appealing than the standard "homemade" cut of soap. I don't think it would work for more complicated swirl work, but it's worked great for a basic bar of soap. COMMENTS: This mold is SO sturdy! I use it for both CP and HP most often, but sometimes MP. The MP comes out better, because of the liquid state of the pour. I have an issue with HP leaving large air pockets, but that is the name of the game! COMMENTS: I love the bars this mold makes. It's a bit larger than a loaf soap bar so the weight will but this gives me more options if I don't want to make a whole loaf of soap and want to try out a few bars in different scents, colors and additions of additives I am wanting to try. "Crafters Choice 15 Cavity Euro Rectangle Silicone"
COMMENTS: Product appears durable and well made. I expect I will be satisfied with its functionality. How well it holds up over time is to be determined. COMMENTS: Love this mold! Great size bars, releases easily. COMMENTS: I cannot rave enough about this mold. I used this for salt bars and was easy to fill, transfer from table to tray and bar release was a breeze. The info says 72os but this is not weight of oils but 72 oz/9 cups of liquid. It holds, roughly, over 3 lbs of soap. Will definitely be doing more with these molds man may have to get more for future large batches. COMMENTS: I find this mold to be perfect. Not hard to release soap. I use it to make saltwater soaps that would otherwise be very hard to cut. COMMENTS: Perfect size for making bars of soap or shampoo bars! Super easy to make a big batch with this mold. COMMENTS: I really like this quality mold! The shape of the bars at first glance appear to be small but in reality are a good chunk size that fit nicely in your hand. I had no issues when it came time to unmold and I've received positive comments about the unique shape. It would be wonderful if there was another size option, perhaps a 9 bar mold for those who wish to make an easy to manage small batch. No doubt I will be purchasing more of these molds in the future. COMMENTS: I use these for melt and pour soap. Very easily to unmold and easy to clean. I love using this mold and I will probably get a few more soon! COMMENTS: I have been dealing with Wholesale Supplies Plus for over 14 yrs now. I love love love this mold! It makes a very professional looking bar of soap, is easy to use once you get the hang of it. The bars pop right out. Very pleased ! "Great but not for me"
COMMENTS: I bought these thinking they were a standard bar size although the soap comes out beautiful and perfect this product was not for me personally. "Great quality as usual from WSP & Crafter's Choice"
COMMENTS: Like my review title, great quality mold from WSP & Crafter's Choice. No complaints here. COMMENTS: This mold is the perfect size for my facial soap bars and salt soap bars. I also use it for my 1lb test batches which make 5 bars. Very sturdy and soap comes out easily. COMMENTS: This mold makes my soap looks like they were cut by a machine, they're easy to unmold and they present professionalism! I will definitely purchase again. COMMENTS: This mold is perfect. It releases the soap super easily without any fighting with it. While the mold itself did change a bit color during the process, it DIDNT hold any fragrance which is amazing. Due to that, it doesnt transfer scents from one soap to the other. I will order more of these in the furture for sure. Worth every penny. COMMENTS: Although it's a bit different than the usual bar shapes...I like it and use it exclusively for my shampoo bars...and my soap stamp fits perfectly on it. I would be nice though if this mold came in a smaller quantity of molds, instead of 15 cavities, 8 would be easier to handle. COMMENTS: This makes nice shaped bars. Have to push a bit to unmold. They have very clean edges and look professional. COMMENTS: This is a fantastic mold. Easy to unmold, a nice sized bar, somewhat different shape than folks are used to, and 15 soaps at one time! I bought 2 of these during the moving sale...so glad I didn't get just one...they are really worth the money. Highly recommend the Crafter's Choice silicone molds in general, but especially this one. COMMENTS: I was skeptical at first glance. No way will my soap weigh ~5oz. BUT it did! And the shape of the bars are different. Reviewed other comments and added salt so the bars would harden quicker for easier release (in 2 days). Will definitely use for brine/salt bars. I'm pleased. COMMENTS: Wow is this the easiest mold to use!!! No work at all. Just wash in warm sudsy water. Pour and set your soap, pop it out. That is it. I can make hundreds of shampoo bars in just a few hours. I use the WSP shampoo and shave bar with a little silk protein and sweet almond oil. I always use the Ivory Lace color bar for my color and whatever fragrance oil the customers want. This mold is terrific. • Ease of use. Durability. COMMENTS: Makes a nice sized bar. Nice to have an option to form bars instead of fighting with difficult to cut soap recipes. I have to remember to put it on a tray so that I can move it after I pour the soap, it's too floppy to move safely otherwise. COMMENTS: I love this mold...I love the shape of the soaps. COMMENTS: First, things I love about this: The size of the bar is perfect. I like being able to have a nice big hunk of soap. I like the proportions, too. Now, for some caveats. It is really hard to get CP soap out of the mold. Sometimes, I think a little more rigidity would help with removing the soap. I tried greasing the mold, and it helps somewhat. I do like this mold, but it is a little unwieldy. I'm sure with experimentation, I'll get it down to a science. COMMENTS: I never order this kind and I am finding myself using it for a couple of special soaps ei. "all organic", "all natural". I love it! COMMENTS: I love this mold! Very durable and soaps come out without a problem. The sides of the soap inside the cavities are very shiny too. Perfect size. COMMENTS: I am a HUGE fan of all WSP silicone molds, but this one has become my F-A-V-O-R-I-T-E 15 bars at once....unique shape....it you want your soaps to stand out in the crowd, buy this mold !!! COMMENTS: Easy to unmold. Nice clean finish. COMMENTS: This mold is great releases soap with ease. You cant go wrong with this mold. "Wanted to love this mold, I realy did!" COMMENTS: When I read the reviews I was so excited to order this mold. Immediately when it arrived I put it to work. As with silicone molds I was expecting to take a bit longer for my bars to harden so I plan to leave my fist batch for 5 days befor I attempted to UNMOLD. On day 5 I attempted this the first time only to find the bottom of the bars where still to soft. So I left them a another 3 days with the same result and this was in addition to sodium lactate to my recipe. Perhaps this is an error on my part but I don't think so. I eventually had to freeze the mold to get nice bars. It was kinda a pain. Will deffinavtly keep trying but probly won't purchase again in the future. COMMENTS: I LOVE this mold! It is SO easy to use and I love to just push the soap out when I'm done. It's so fun! I've only used it once so I can't yet testify to it's durability, but it seems like it will be around for a while. The only disadvantage I have is that I don't usually make this deep of soap bars, so I don't fill mine all the way up. That makes it a bit more difficult to make consistent sizes. But I still love it! COMMENTS: I wish i ordered more than just one now out of stock. :)Will be def buying more.Very cute bars comes out perfect. "Silicone molds....The way to go... 15 bars at once"
COMMENTS: Cannot say one bad comment on this mold. I filled all 15 cavities with the microwaved soap base and all of the soaps released without one single problem. I have used plastic in the past and decided to purchase 2 silicone molds. Glad that I did. These molds made the soap making process a breeze. Plan to order more silicone molds in the near future. • Exceptional value for your dollar. • Ease of use. They pop right out! • Can't think of anything. "My CP soap recipe is based on weight, this tray is based on Volume, are you aware of how best to evaluate how much ingredients to use to ensure one can fill all of these cavities?" "What weight of oils will this fit?" Staff Answer We know this mold holds approximately 72 oz. of soap but we are not able to tell you the weight of oils you would need in your recipe. "when building a recipe, how many ounces should I use?" "Can I use this mold for Cold Processing? " Yes, majority of silicon mold can be use for cold processing. Also, it's good to use sodium lactate with it for easier removal. Of course you can! You just might have to wait a few extra days to unmold (depending on your recipe), as sometimes using smaller silicone molds for CP soap can be more difficult to unmold. Adding Sodium Lactate at 2% of your oil weight helps to make the soap harder and easier to unmold. Freezing the mold with the soap in it helps to remove the soap too. You can! I do wait a few extra days before unmolding them. If I am not super patient, I stick them in the freezer for a bit. Just be careful when unmolding if they have been in the freezer. "Will the finished product fit into your soap boxes?" Staff Answer no, the finished bars Measures 2.8" x 1.8" x 1.5" deep and the boxes measure 2 3/4" x 3 13/16" x 1 3/16" deep. "How many ounces are the cavities?"